(Nanowerk News) Sufferers of eye disorders have new hope after researchers at the University of Reading discovered a potential way of making eye drops more effective. Typically less than 5% of the medicine dose applied as drops actually penetrates the eye - the majority of the dose will be washed off the cornea by tear fluid and lost. The research could also pave the way for new treatments of currently incurable eye-disorders such as Age-related Macular Degeneration (AMD) - the leading cause of visual impairment with around 500,000 sufferers in the UK. Professor Vitaliy Khutoryanskiy, from the University of Reading's School of Pharmacy, said: "Treating eye disorders is a challenging task. Our corneas allow us to see and serve as a barrier that protects our eyes from microbial and chemical intervention. Unfortunately this barrier hinders the effectiveness of eye drops. 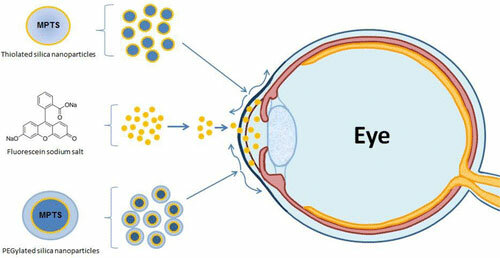 Many medicines administered to the eye are inefficient as they often cannot penetrate the cornea barrier. Only the very small molecules in eye drops can penetrate healthy cornea. "Many recent breakthroughs to treat eye conditions involve the use of drugs incorporated into nano-containers; their role being to promote drug penetration into the eye. However the factors affecting this penetration remain poorly understood. Our research also showed that penetration of small drug molecules could be improved by adding enhancers such as cyclodextrins. This means eye drops have the potential to be a more effective, and a more comfortable, future treatment for disorders such as AMD." The finding is one of a number of important discoveries highlighted in a paper published in the journal Molecular Pharmaceutics ("On the Barrier Properties of the Cornea: A Microscopy Study of the Penetration of Fluorescently Labeled Nanoparticles, Polymers, and Sodium Fluorescein"). The researchers revealed fascinating insights into how the structure of the cornea prevents various small and large molecules, as well as nanoparticles, from entering into the eye. They also examined the effects any damage to the eye would have in allowing these materials to enter the body. Professor Khutoryanskiy continued: "There is increasing concern about the safety of environmental contaminants, pollutants and nanoparticles and their potential impacts on human health. We tested nanoparticles whose sizes ranged between 21 - 69 nm, similar to the size of viruses such as polio, or similar to airborn particles originating from building industry and found that they could not penetrate healthy and intact cornea irrespective of their chemical nature. "However if the top layer of the cornea is damaged, either after surgical operation or accidentally, then the eye's natural defence may be compromised and it becomes susceptible to viral attack which could result in eye infections. "The results show that our eyes are well-equipped to defend us against potential airborne threats that exist in a fast-developing industrialised world. However we need to be aware of the potential complications that may arise if the cornea is damaged, and not treated quickly and effectively."